French designer Sylvie Facon crafts clothing from materials including book spines, sheet music and an actual violin. Got too many books piled up at your house? 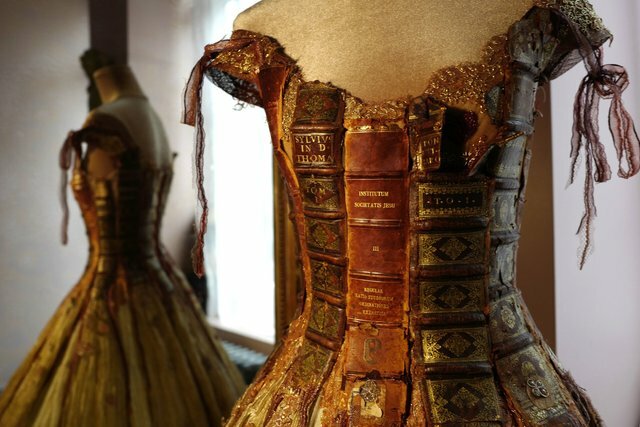 Here’s an option for recycling them that I never thought of: this strangely beautiful fairy-tale dress from French designer Sylvie Facon, with a bodice made of leather book spines. Facon, whose Instagram is a delicious rabbit hole of fantasy gowns (other materials include sheet music, painted landscapes on fabric and a dress featuring an actual violin), crafts clothing that tells stories — in this case, quite literally. Now, how would this look if made from worn-out paperbacks?